I find it so incredibly uplifting to experience people who share their craft with great passion and expertise. I'm talking about the ones who communicate that enthusiasm and knowledge in a very human, engaging, and inclusive manner - none of that bigger-than-life, dry, holier-than-thou posturing to discourage "the rest of us" from enjoying and benefiting from a little piece of their wisdom. Courtesy of the Wall Street Journal, I heard about one of these wonderful individuals last Friday in an article about deregulation in the wine industry and how it is dramatically changing the game for producers, wholesalers, retailers, and consumers (see "Wine Sales Thrive As Old Barriers Start to Crumble" in the 8/25/06 WSJ). The very end of the article mentions how this guy named Gary Vaynerchuk hosts an online wine tasting video series, and how Gary describes the "nose" of a $60 bottle of old-growth Tuscan red as being like that of "stinky socks". OK - liking wine, streaming web video, and interesting personalities, I had to check it out. Man, I'm glad I did. And you should check it out too (http://tv.winelibrary.com/), whether you like wine or not. 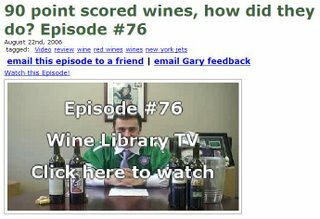 Gary hosts a daily (Monday through Friday) video wine tasting Blog. Just watch a clip or two. You can't help but come away with a smile on your face, a nugget or two of interesting new information, and an overall positive feeling (unless I suppose you are the purveyor or owner of that stinky $60 Tuscan red). That said, there is a lot more to be learned here than just wine tasting technique. Take a close look at how Gary relates to his craft, his audience, and his colleagues (see episode #78 for a good example of the latter). I think it is really something to admire and emulate, regardless of your profession. I like how Gary is self-effacing, good-humored, and down-to-earth, yet still extremely capable, confident in his abilities, and certainly no pushover. Check out episode #76. Gary opens the video by passing along the comments from a few disgruntled viewers (you can't please everyone). One detractor characterizes Gary as a dumb "jock tasting wine like it is beer". So here is Gary delivering episode #76 in a bold green New York Jets jersey. A football-clutching Joe Namath grins over Gary's shoulder from a photo mounted in the background. Nice atmosphere for a wine tasting. What a character! In another favorite sequence after Gary tastes a cheap but surpisingly good bottle of wine, Gary leans conspiratorially into the picture, tells the "traditionalists" to hit the pause button, and proceeds to let "the rest of us" know that this wine "ROCKS!". The somewhat more subtle message is that Gary is just like millions of regular folks out there. But that fact doesn't disqualify him - or you and me for that matter - from enjoying the traditionally high-brow world of wine. In fact, despite his just-one-of-the-guys demeanor, Gary knows his wine as well as anyone, and he's not afraid to prove it. "I challenge every single person who sends me negative publicity to a blind tasting and let's see who knows something", he confidently declares leaning into the camera. Yeah, Gary, you tell those stuffed shirts. I like how the videos allow us to see and experience Gary and his craft in action. It makes the abstract concrete. It allows us to get comfortable with ideas and techniques that, when just read about, remain mysterious and intimidating. A simple example: the spit bucket. I've read about tasting before and how one should spit out the wine after each tasting, but I've never felt comfortable actually trying it myself. Too many nagging questions about what would be considered acceptable technique, how you avoid dribbling on yourself, etc. - the minute details that the written word struggles to capture efficiently. But, there is Gary, in his Jets jersey showing us the way, making us comfortable with the foreign and the potentially awkward, lowering our natural barriers of intimidation. It makes it so much easier and comfortable to translate knowledge into our own application when you can see it clearly in action. I like how the videos are not overproduced. Someone wrote in a comment on one of his early episodes complaining about the low quality of the "production values". I think that person simply doesn't get it. The lack of overly slick polish and editing is one of the reasons these videos are so engaging. They are real. Gary does not edit out little slip-ups, side comments, or noises from left field on the set. It feels like you are sitting down one-on-one with Gary and having a conversation across his desk. It is all very accessible and human. Just the right amount of professionalism and production to effectively present the message without obscuring the real content, the real person, the real experience. No super-fancy set, no slick lead-ins, no distracting music - just Gary, the wine, his passion, and the tasting process. I like how Gary is fallible. He is clearly an expert, but he makes mistakes and is candid about owning up to them (like when he readily admits in episode #79 that he bungled some of his tasting in the prior episode due to his less than perfect state of mind after the emotional passing of a close colleague and friend). I don't think that detracts from his expertise - it makes him more human, more credible, more accessible. It is a good reminder for all of us to have the confidence to know that openly acknowledging a mistake does not necessarily undermine our expertise or our authority. I like how Gary doesn't engage in any overt hard-selling techniques. Yes, he is in the wine business and makes money selling the wines he discusses in his videos, but that doesn't keep him from giving an honest opinion about an expensive wine that he thinks fails to cut the mustard; or, on the flip side, singing the praises of a $7 steal. The focus is all on imparting knowledge about his craft and creating a lasting bond with fellow enthusiasts - not just selling bottles of wine to random customers one transaction at a time. Oddly enough, according to the WSJ article, even the wines he pans end up selling. I'm guessing that's because folks want to see if they can replicate his analysis - taste those "stinky socks" just like Gary did. It's as much about the process as it is about the end result. To date, I have not bought a single product from the Wine Library, but I'm sure that I will someday, if for no other reason than the fact that I admire Gary and enjoy the experience he is sharing. To me, that's just good business - no hard-sell needed. The bottom line in all of this for me: If you develop a deep expertise in a craft that you absolutely love, and if you share that craft with others in a passionate, creative, fun, and human way, you simply can't go wrong in business and in life. I just checked out episode 80. Gary refers to a wine as having a "cat piss" nose (which is, according to Gary, a legit wine tasting term in New Zealand). Classic. He also tastes a wine from Chalk Hill, next to Rancho del Rio (i.e. the Reedy Vineyards! ), which gets high marks. Is that the Chalk Hill in healdsburg? If so , I'm a half towards Windsor from Chalk Hill. Small world. Bill, An excellent analysis of WLTV and of Gary Vaynerchuk in particular. I agree 100% with everything that you've said. I want to share a story of my interaction w/ Gary so far which I think further comfirms much of what you've said about him and what kind of guy he is. I am the "Chris Stan", creator of the "Gary Vaynerchuck Greatest Hits" spreadsheet (mentioned at the end of Episode #86). Initially, I created this spreadsheet for myself to keep track of Gary's recommended wines from each episode. At some point, I emailed this to Gary (it should be noted that, up to this point, I had NO interaction whatsoever with Gary other than buying some wine from Wine Library). You would think that he would be too busy and overwhelmed with his workload and the sheer volume of emails --but he responded back quickly and enthusiastically. Subsequently I sent emails asking questions to help me fill in "missing" info and at one point apologized for bothering him with such minutae. He responded back saying, "CHRIS ARE U CRAZY, your not bothering me im honored and humbled by you!!!" In my mind this confirms much of what you've said about Gary. Besides his enthusiastic mention on Ep. #86, he has now put me in touch with a few of his IT guys and we are working on making spreadsheet a standard part of the WLTV website to make it available for all WLTV viewers. Pretty cool. That is a great story - a true example of a virtuous cycle. Thanks for sharing it. I look forward to seeing your spreadsheet on the Wine Library site - sounds cool. After I posted on the Wine Library video blog last night, Gary wrote me an email saying he had already seen my Blog entry just after it came out and, in fact, he had even ordered a "Super Cow" mug off my son's cartooning site - WillToons.com (which I failed to notice at the time). Very cool! Bill, Very cool that he read your blog and really cool that he bout a mug. Another great story highlighting what kind of guy Gary is. I’m glad to see that Gary is getting some great press and feedback from wine lovers from around the world. Gary told me that he had seen my blog soon after it was posted, so we know he’s out there looking for reactions to WLTV. My blog entry can be found at http://blog.thegrapenuts.net/?p=35"
Not only is Gary a good guy, but he appears to be be omnipresent! !